What Is White Gold? Where Does It Come From? Why? Movies, magazines, and even Crayola crayons teach us that gold is yellow in color. If that is the case, then what is white gold? White gold is an alloy of the gold we all know and some kind of white-silvery metal such as nickel, manganese, or palladium. The most frequently used alloys, or mixtures, in jewelry are gold-palladium-silver and gold-nickel-copper-zinc. Palladium and nickel serve as a bleaching agent in white gold while zinc bleaches out the color of the copper. Today, white gold has become a popular alternative to traditional gold. While not as inexpensive as silver, it is less costly than the trending favorite platinum, and it can help avoid some of the common misgivings of silver. Many find silver not hardy enough for everyday use and particularly do not care for its pre-disposition to tarnishing. You know, that icky, dull grey or black film that begins to develop on your grandmother’s silver when not polished. Given its durability and cost, white gold is arguably the best alternative for its hue. Similarly to the traditional yellow gold, the purity of white gold is measured in karats. Because it is an alloy, white gold is not pure gold. Instead it is mixed with other metals to give it its color and increased durability. Aside from the metals mentioned above, you may also find zinc, copper, or even silver added to white gold. The actual color and finish of white gold is not inherently as you see it glistening in the case at your local jewelry store. That shine is a result of the rhodium plating that is applied to nearly all white gold jewelry. 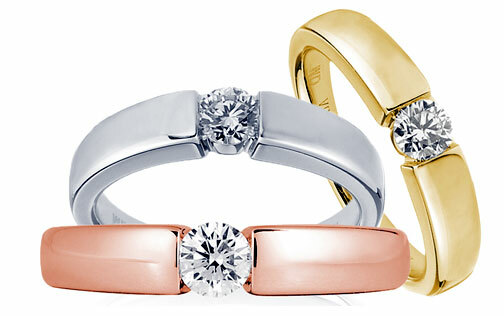 Without the addition of rhodium, white gold can appear dull and in a gray, brown, or washed-out pink color. Though a favorite for its color category, the alloys present in white gold can cause allergic reactions. It is estimated that greater than 10% of the population has a sensitivity to nickel that can cause unsightly and uncomfortable skin rashes on the exposed areas. Many jewelry manufacturers now abstain from using nickel as a result, but if you have a sensitivity to nickel, be sure to ask your jeweler if it was used in the piece, especially with vintage jewelry. Fill your noggin with more than you ever wanted to know about white gold, yellow gold, and all the rest here. Just don’t let your significant other catch you or you might have an awkward conversation on your hands.